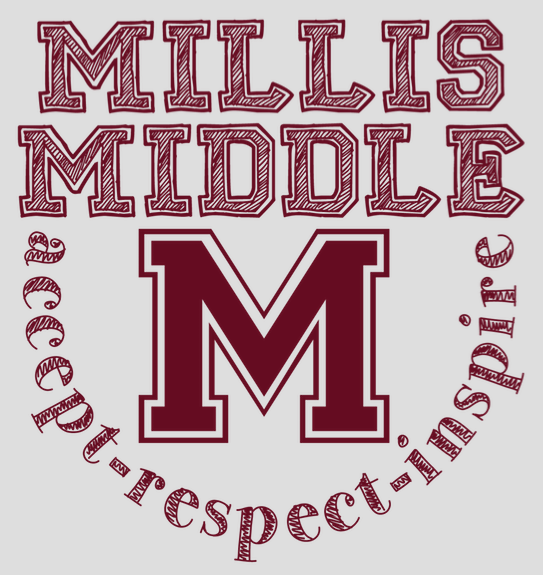 Millis Middle School is a grade 5-8 school of approximately 400 students. We support the district's Personalized Learning Goal to honor each student as an individual learner, recognizing that each student has his or her own learning style, interests, passions, challenges to learning, strengths and skill level. We engage all learners through varied instructional approaches so that students are afforded flexibility in how they learn and how they demonstrate their understanding. Teaming and collaboration is an integral part of the Middle School culture, and technology has transformed the way we teach, engage, work and communicate. Middle School classrooms are learner-centered environments, and teachers make the most of traditional classroom space by using technology to design blended learning experiences. We aim to develop expert learners, who are resourceful, goal-directed, and motivated. Our staff, students, and families combine to create a united school community focused on a positive school climate and academic growth! Remember Great American! Family and friends may order all year from the online store at www.gaschoolstore.com Our School Code is 2674653. Read More About Remember Great American! Family and friends may order all year from the online store at www.gaschoolstore.com Our School Code is 2674653. Online Back-to-School Forms are now available! Read More About Online Back-to-School Forms are now available! The MHS library will be open from 7:30am - 3:30pm Monday through Thursday. The library will close at 2:30 on Fridays. Students are welcome to come to the library before or after school to use resources. The Millis Public Schools will continue to use the “reverse 911” School Messenger system to call households for school cancellations, delays or early closings. We now have a mobile app available for iOS and Android phones.